Since 2008 my friends and I have been road tripping to see our favorite band, Hanson. We’ve been to Milwaukee, Detroit, New Orleans, Kansas City (I wasn’t on that one), Memphis, and Tulsa (the ultimate Hanson fan pilgrimage). Some people think we’re crazy, but we look at it as a way to see new places and Hanson gives us the excuse to get together and travel (other non-Hanson related trips never seem to get off the ground, lol). 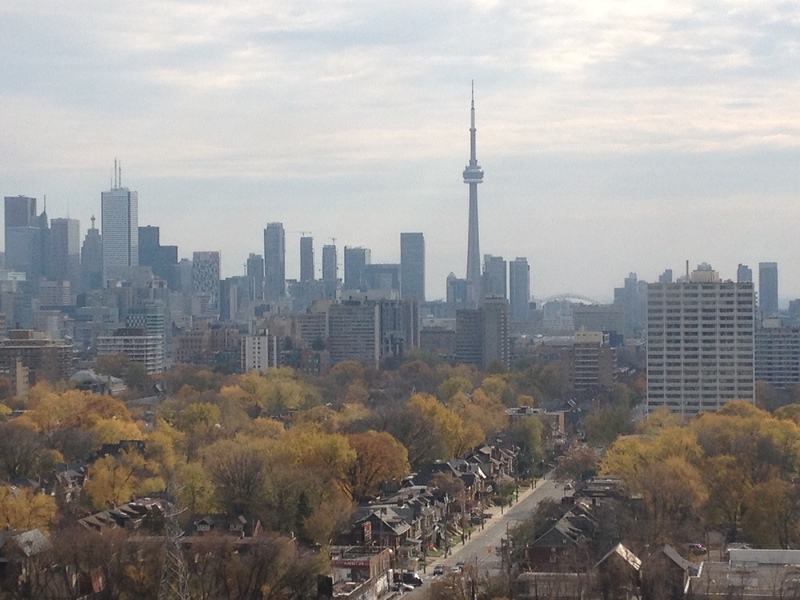 This time around, we decided to take things internationally and head north to Toronto, Ontario. 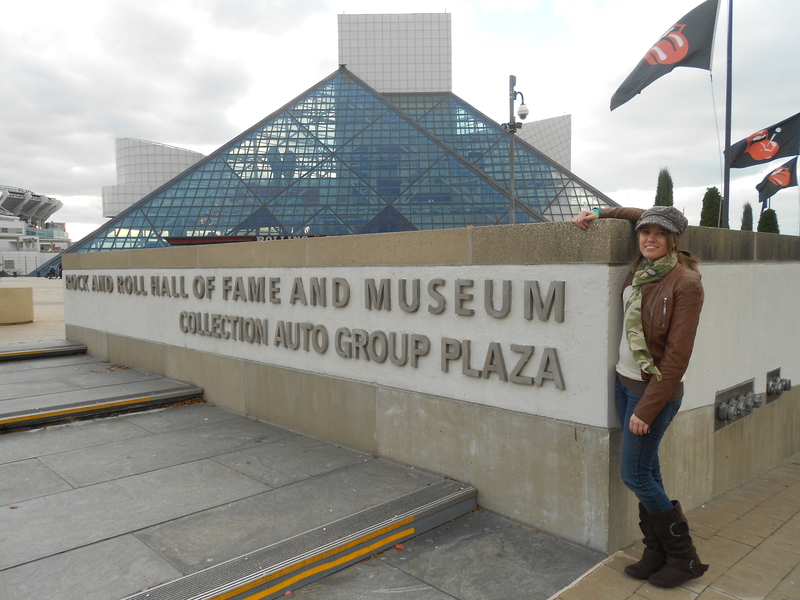 I met up with everyone in Cincinnati and from there, we drove the three or so hours to Cleveland, OH where we paid tribute to the greats of Rock and Roll and made a stop at the Rock and Roll Hall of Fame. Cleveland was COLD!! In fact, it was snowing when we arrived. Fortunately, we’d anticipated this kind of weather and everyone brought warm coats, hats and scarves. After spending a couple hours in the museum, I wanted to visit the Rock and Roll Hall of Fame Library and Archives, so we made a quick stop there before heading to Superman’s creator’s house. Once we’d seen everything on the list in Cleveland, we headed up to Buffalo, NY where we had dinner at the Anchor Bar Restaurant, which is home to the original buffalo wings. The food was good, the service not so much. Our waitress wouldn’t split our check six ways, so somehow those of us who paid with credit cards ended up getting charged more than we should have been. After dinner, the border was just a few minutes away! We didn’t have any issues going across even though we’d painted “Canada, eh?” on the back of the rental van. 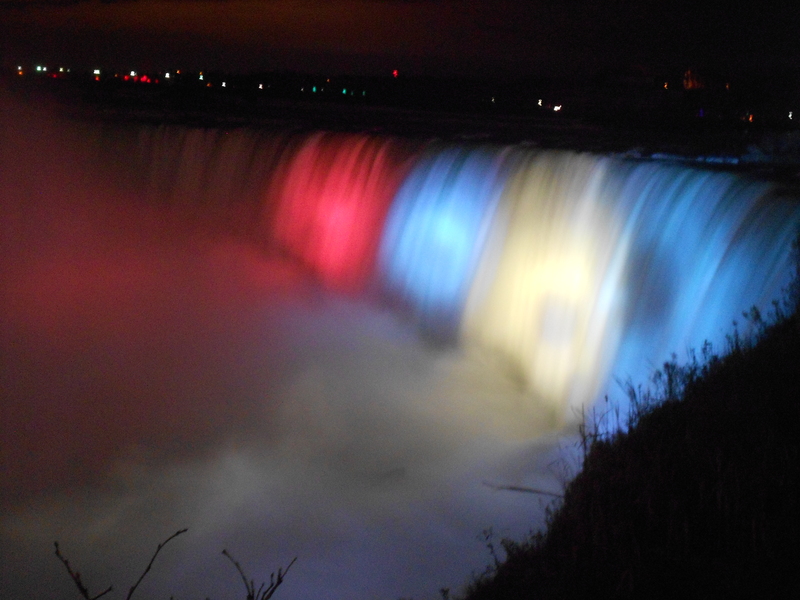 The Canadian side of Niagara Falls is right across the border, so we stopped there to see the falls at night. Such a pretty sight! From there, it was on to our hotel in Toronto for the night. Saturday morning, Jenny and I got up early so I could visit a few places in Unionville, ON, the filming location for the pilot of my favorite TV show, Gilmore Girls. We visited the town gazebo, Luke’s Diner (which is a dress shop now) and the church that appears in the opening theme song/credits. Then it was back to the hotel to pick up everyone else, find a money exchange and visit Casa Loma, a huge castle built by a former millionaire from Toronto. Once we’d toured the castle, we spent a little bit of time downtown, which reminded me of a less busy New York City. 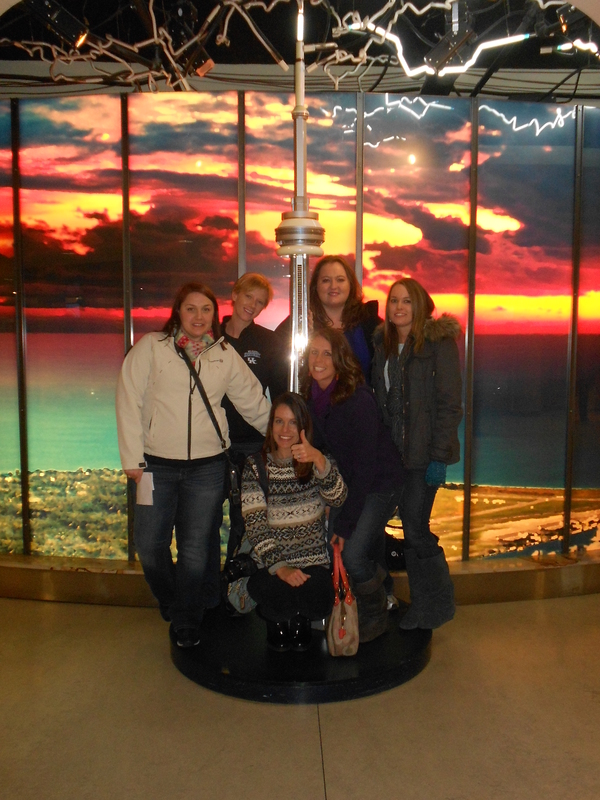 After walking around and deciding on lunch, we drove over to the CN Tower and took the elevator to the top. It was a neat view of Lake Ontario and the city itself, but I think I enjoyed the Space Needle in Seattle more. Still worth a visit though if you’re ever there. By this point it was starting to get dark. We had plans to visit a beach and some pretty bluffs at the beach, but by the time we drove out there, it was completely dark and we couldn’t even find a path down to the water. So we headed back toward the Greektown district where the concert venue was located. Dinner at a Greek restaurant was delicious, although I think I might be the only person who actually enjoyed it and we had another issue with splitting checks again. After dinner, Allison and Heather dropped the rest of us off at the Danforth Theater for the sold out show (and my 23rd Hanson concert). 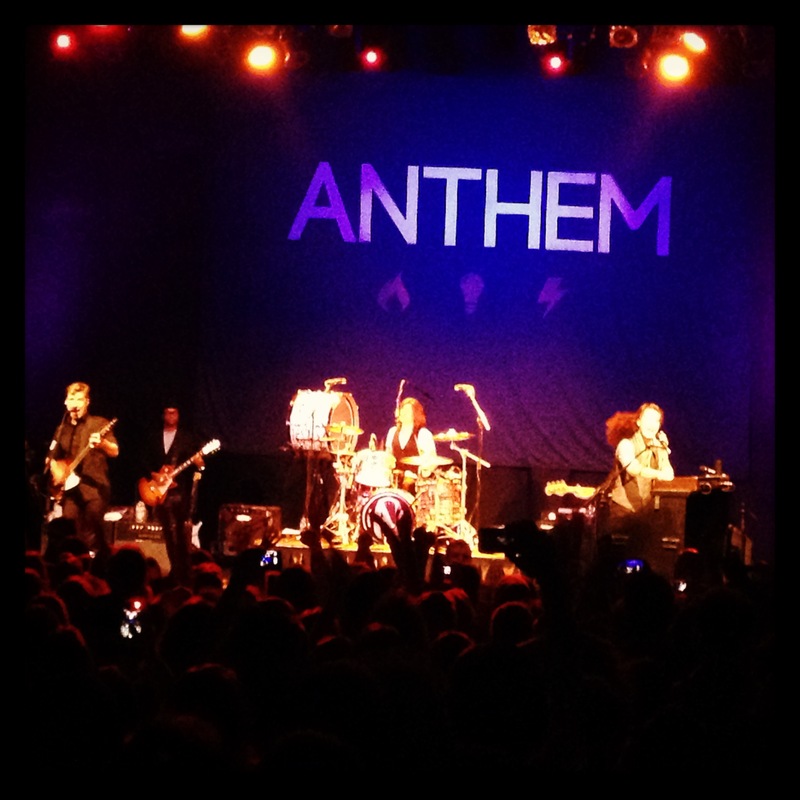 The guys sounded fantastic and I can’t say enough about how relaxed the Canadian fans were! We’re used to encountering girls camping out several days on the sidewalk in tents and then getting possessive about their place in line. There’s usually also a lot of pushing and crowding at the shows and we had none of that. Plenty of space and freedom to dance and move around during the set. It was also great to see some other friends from the states that had also made the trip to Toronto. It was time to head home on Sunday morning, but before we left Canada, we made sure to stop at Tim Hortons for coffee, doughnuts, and hot chocolate. We also visited Niagara Falls again to see it during the day and even though it was windy, cold and misty, it was still worthwhile to see. Nine hours later and after a couple of stops for food, photo ops at state signs, we were back in Kentucky and parting ways. It’s amazing how a little band from 1997 can bring together a group of very different people and create friendships. I’m incredibly fortunate that I’ve been able to travel and see so many different places – hopefully there are more trips in the future.